LEXINGTON, Ky. (AP) - Kentucky Gov. Matt Bevin is teaming with Education Secretary Betsy DeVos to promote school choice initiatives. The proposal would provide federal tax credits for donations made to groups offering scholarships for private schools. A similar tax credit proposal in Kentucky failed in this year's legislative session. The proposal was opposed by public education groups. DeVos is the latest Trump administration official to hold an election-year event with Bevin in Kentucky. Bevin is seeking a second term. The Republican governor is an outspoken supporter of President Donald Trump. Bevin has also had appearances this year with Ivanka Trump, Transportation Secretary Elaine Chao, EPA Administrator Andrew Wheeler and drug czar Jim Carroll. Vice President Mike Pence campaigned for Bevin. "Students, parents and educators in Kentucky who have seen school budgets and programs gutted under the leadership of Matt Bevin could face no starker a reality than handing the future of public education over to he and Education Secretary Betsy DeVos. 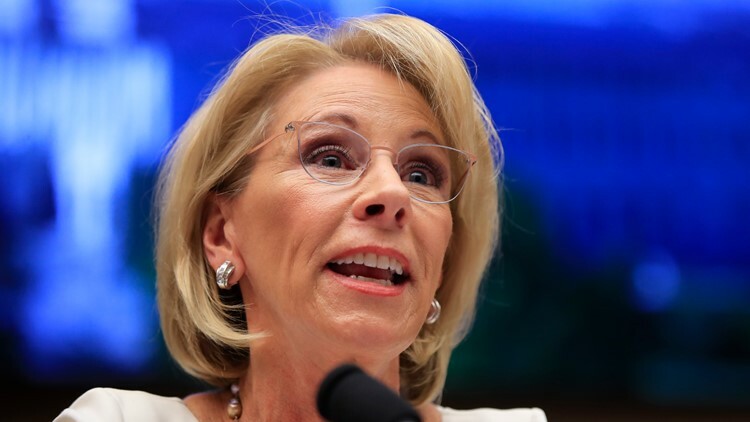 Today’s gathering of education “reformers” was nothing more than a collection of big donors who want to gut public school budgets in favor of for-profit voucher and charter school funding. It’s ironic that this group gathered at the publicly-funded Bluegrass Community & Technical College because Bevin, DeVos and their fellow anti-public education advocates refused to hear from any public-school stakeholders who might dare to disagree with their rush to privatize public education. Kentucky legislators already dismissed a similar Bevin-supported proposal in its last session that’s similar to DeVos’ proposed federal program to give $5 billion in tax breaks to the wealthy in order to fund vouchers and charter schools and further gut public education. Today’s meeting was nothing more than a photo-op for a failed governor and a failed education secretary who refuse to listen to those who may disagree with their proposals. In November, Kentucky voters can decide if they want two individuals like Bevin and DeVos who never attended public school to make policy for their children’s futures, or do they want local educators, school board members, superintendents and parents looking out for what’s best for their neighborhood schools."